Munchkin is the one that started it all: a game franchise to rival the Catan universe. Steve Jackson Games takes you on a dungeon adventure where you'll battle monsters, backstab your buddies and grab all the treasure you can. Are you a Munchkin or a mouse? Munchkin is a card game with a great sense of humour which will have your crew snorting milk (or whatever you choose to drink) out your noses in no time. There's lots of player interaction. It's a quick, fun way to spend an hour without getting all serious over a game. You start the game as a level 1 human munchkin with no class (ha, stole that from the rulebook). You divide the cards into dungeon cards and treasure cards amdn make 2 face-down, shuffled piles. Every munchkin starts with 2 dungeon and 2 treasure cards in their hand. You immediately play any of these cards if you can/like. They will give you armour, weapons, majic items, and even change your species and class! You can become an elven wizard, a halfling thief, and more. Alright, you're ready to go. In your turn you're going to open a door in the dungeon and deal with whatever is behind it. If you meet a monster, you can kill it and take its treasure, or you can run away if its going to clobber you. Combat is resolved by taking your level, adding modifiers for your class, magic items and weapons, and comparing them to the level of the monster. If you can't beat it by yourself, you can ask for help from another player, but you'll probably have to pay to do it. And watch out, other plays can cast spells to hinder you, or even call in extra monsters to make sure you fail! If you kill the monster you get its treasure (more cards to play) and go up a level. If you didn't kill the monster. You have to run away. If you don't escape, Bad Stuff will happen to you! That can be losing items, losing levels, and even dying! But don't worry, you're a resiliant Munchkin: you get back in the game next turn (stripped of all possessions, but keeping your class/race/level). If you didn't meet a monster when you opened your dungeon door, you can play a monster card out of your hand so you can gets its treasure. Otherwise you can search the empty room and get something for your time anyway. Finally, you have to discard down to 5 cards by giving any extra to the lowest-level player, or straight discard if that player is already full. The fist Munchkin to make level 10 is the winner, so watch out! The other munchkins will be snapping at your heels when you hit level 9. Get ready to battle! Munchkin is a really popular game because it's a fun, humourous take on the swords-and-sorcery genre. For anyone that played D&D, or enjoyed the Conan films, this is just great fun. It's a well-balanced card game that works for a larger group of 6. And it has so many varients and companion games that it can entertain you for dozens and dozens of plays. 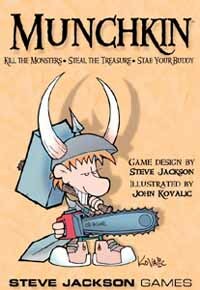 Munchkin will be a "first-choice" game for a lot of groups because of the fun time it provides the players.